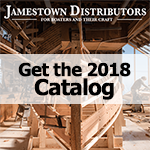 Jamestown Distributors online store: We have more than 75,000 products available for purchase on our web site. Our Call Center is ready to take your order from 8:00 am to 5:00 pm EST Monday through Friday. Please have your customer number and order details available when you call. When faxing orders, please clearly list the part #, quantity, shipping address and phone number. We gladly accept payment with American Express, MasterCard, Visa or Discover credit cards. Flammable and hazardous items may not be shipped through the USPS or via UPS/FedEx air service. We do not back order items under $10 in value. There is no free shipping on backorders. Fast and reliable -- Jamestown Distributors will ship anywhere in the world. Items marked with an asterisk can only be shipped via ground transportation. Some package's shipping charges are not calculated on the web or included in your total. Some shipping charges can only be calculated once your items have been picked and packed. Your shipping charge will be the exact amount it costs us to ship your product to you, plus $2.50 shipping and handling per package. Rush Order: Expedited Delivery is available on some items for an extra fee. Expedited Service is for Ground shipments only (Not available via USPS). If the order is placed before 3pm EST Mon-Fri your order will ship that same day. All packages over $100 are insured. Insurance is included in the shipping charge. Offer is only valid for online orders containing the qualifying coupon code. Order may be shipped via Ground shipping only, within the continental U.S. only. Some product exclusions apply. Items not eligible for this promotion include, items marked "hazmat product" in your shopping cart, storage shelters, shrink wrap rolls, boats, kayaks, boat stands, any liquids over 5 gallons, Torqeedo motors, any items over 6' in length, as well as any other heavy and/or oversized items that cannot be shipped UPS ground or items that require additional UPS charges. Excluded items are at the sole discretion of Jamestown Distributors and may include additional items not listed here. Free Shipping offer is valid only for orders placed with an appropriate coupon code. Only orders shipped via Standard Ground shipping and within the Continental U.S. will apply. This offer can not be combined with other special promotions and coupons. Limit one shipment per customer. If you have any other questions about shipping please call us at 1-800-497-0010 or email us. When you shop at Jamestown you're not just buying products -- you get Technical Support and Advice that you will not find anywhere else. Our knowledgeable team is here to help you with your projects. Please call Monday through Friday 8:00 - 5:00 EST Our Tech Help is a free service available for current Jamestown customers only. No Returns for special order items, clearance items, electronics, boat covers, cut lengths of material or hazardous materials, such as paint, resins and adhesives.